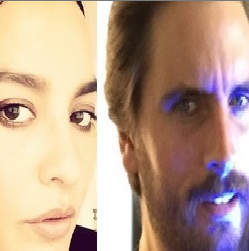 Scott Disick's blatant cheating with ex-girlfriend Chloe Bartoli is NOT being filmed by E! cameras. Oh boy. Scott Disick and Chloe Bartoli’s cozy PDA pics may be even more serious, as HollywoodLife.com EXCLUSIVELY learned that they are not filming for ‘KUWTK.’ In fact, Chloe and Kourtney Kardashian are not at all friends, despite reports saying they are. Anyone who watches Keeping Up with the Kardashians knows that Scott Disick, 32, and Kourtney Kardashian, 36, have hit roadblocks in their relationship due to Scott’s partying and flirtatious nature. But after Scott was caught snuggling with Chloe Bartoli, 25, in France on July 2 and 3, HollywoodLife.com EXCLUSIVELY learned that there was not a single KUWTK turned on. Yikes. Scott has some serious explaining to do. As pics surfaced of him showing affection for Chloe by touching her hair and putting his arm on her, a source tells HollywoodLife.com EXCLUSIVELY that Scott and Chloe were not filming for KUWTK. That’s a frightening thought, seeing as though they looked very, very close without Kourtney knowing. That is, until she saw the pics and became furious. Also, despite reports claiming that Kourtney and Chloe are friends, our source assures us that “Kourtney and Chloe are not friends.” This makes everything that much more complicated. While Khloe is livid with Scott, her whole family doesn’t know what’s going on either and they are incredibly upset over Scott cozying up to someone who’s obviously not Kourt. It’s heartbreaking, especially for the sake of their family and three kids together! That's what happens when you have children with a man you are not married to....he may decide to leave you...toodles noodles! i wonder if the media is going to refer to her as "Scott's baby mama"? ^^^You do know that married men can leave their wives right. Harder, not impossible.